Posted on June 17th, 2014 in Uncategorized. No Comments. I’ve been spending a lot of time making cool notebooks over the past few weeks. 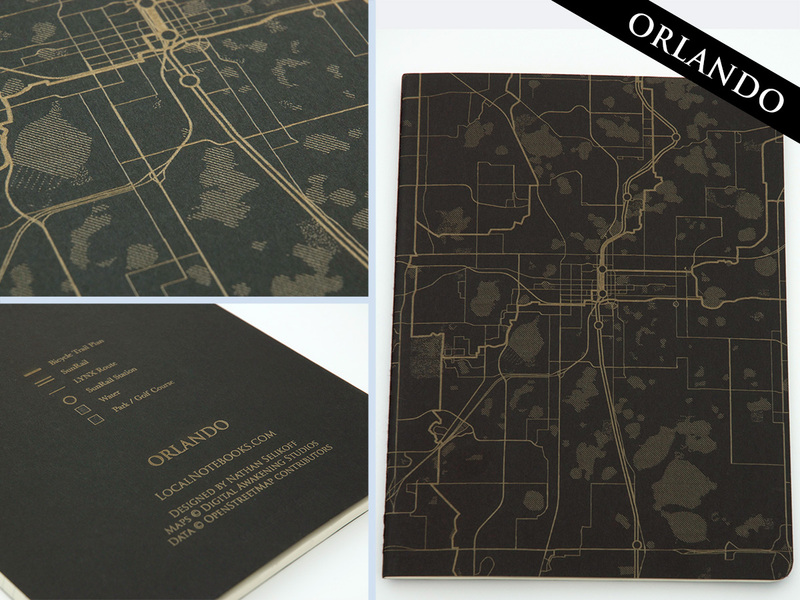 Here’s the design for the newly finished Orlando Edition. Although our city is very spread out and car-dependent, this map envisions it differently. SunRail (our new commuter rail) runs north-south; thick lines show the proposed city-wide trail plan (longer-distance bicycle routes), and the thin lines are all the places you can go on a LYNX bus. The many lakes and parks of Central Florida provide the backdrop. Map making is quite intoxicating, I will say! I didn’t know anything about it, or GIS (Geographic Information Systems), but I was able to get up to speed with some really powerful open source tools like QGIS, TileMill, and OpenStreetMap. These notebooks with local neighborhood maps are part of a spinoff project that I hope will continue to grow and expand. Right now you can order the Orlando, College Park, Winter Park, Audubon Park or Thornton Park editions at LocalNotebooks.com. If you live in a neighborhood where people love the place they live and are into alternative transportation, let me know and maybe it will become the next design!